There are two things it is impossible to ignore in Ireland right now -- three actually if you want to be pedantic about it. One of them is actually two, the Grimes twins John and Edward, who trade under the name Jedward and flew the flag for Ireland quite spectacularly at the Eurovision Song Contest last weekend. They didn’t win the thing in Germany, thankfully, as it would have cost us a fortune as we would have been responsible for hosting the contest next year at a cost of millions. But a bit like Jack’s Army in 1988, Jedward did the nation proud and changed a few perceptions of our land, currently in the throes of a dark and dismal recession. My intention this week was not to mention them and I won’t anymore, even if they did add a little entertainment value to my nephew Eddie’s Communion party in Cork, and we have to thank them for that. The other subject I was trying very hard to avoid on these pages this week was the Queen’s visit, mostly because it is being covered so well elsewhere in this paper that there’s no need for me to add my tuppence worth. And it would be easy, a la the Life Of Brian, to ask what the Queen ever did for Irish sport until you realize that she is going to do wonders for the horse industry and the GAA, of all things, on her travels this week. Queen Elizabeth’s visit to the National Stud and her self-confessed love for Irish racing can only help that industry at a time when any Irish industry will take any help it can get. Her decision to visit Croke Park on Wednesday, scene of the original Bloody Sunday tragedy, is also hugely significant and will no doubt raise worldwide interest in the GAA and its games which can’t be bad for the country’s biggest sporting organization either. 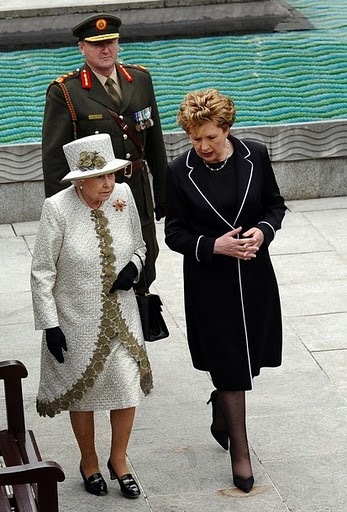 So yes, the Queen’s visit to Ireland does have a sporting connection, and it probably should be acknowledged here, but that’s not really the reason why I bring it up now. Watching the live television pictures of her visit on Tuesday afternoon, a thought struck me - just as a stone struck a policeman on duty as dissident Republicans rioted on Dorset Street in Dublin as it happened. Several groups managed to protest in that part of town as the Queen laid a wreath at the Garden of Remembrance in honor of the very leaders of the 1916 Rising they claim to follow, ironic and all as that is. They were few in number -- most of us on this island have moved on as best we can from our history’s violent past -- but they are entitled to their opinion seeing as how we still live in a democracy, even if we have surrendered all sovereign power to the IMF and the EU. What got me, as I watched the live coverage of their protests on Sky, was the hypocrisy of some of their number, the same hypocrisy that was evident when people of a similar stance protested when England first played international rugby at the aforementioned Croke Park. One of the guys who protested against the playing of foreign sports at GAA headquarters that day wore a Celtic shirt. So did some of those protesters on Tuesday. Do they not realize that Glasgow Celtic are based in Scotland, part of Britain the last time I checked? Do they not know that all taxes paid by Glasgow Celtic shareholders and players go to the very Queen they were protesting against? Instead of shouting at the Queen, they should apologize to all connected with Glasgow Celtic for dragging their club into the gutter in front of the eyes of the world. That’s why they deserve to appear in this column after all.